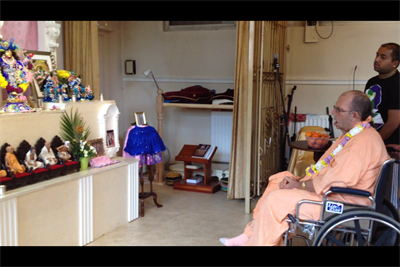 HH Jayapataka Swami insisted on visiting ISKCON Coventry even after the cancellation of a previous planned visit. HH showered His mercy & blessings on the Coventry yatra appreciating the kirtans, deity dressing, garlands of the deities and the continued 20 years of enthusiastic and dedicated service to Sri Sri Sacinandana & Nitaicand. Maharaj explained the important of preaching and fulfilling Srila Prabhupadas mission and helping Lord Caitanya distribute Krishna Consciousness to all. Maharaj briefly visited on His way to London and His enlivening visit inspired the devotees present.